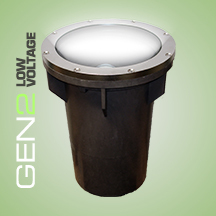 The Genesis Gen2 line of LED Lanscape Burial Lights are the most versatile LED fixtures on the market today. Various beam spreads and wattages allow for a customized finish to any property. The high end residential grade system was designed for low voltage operation residential applcations. The housing is made of compression molded fiber reinforced polyester composite. The color impregnated SR2 composite will not flake or peal. The LED light source is housed within a aluminum LED body with heat dissipating fins. An anti-siphon chamber is molded into the housing to keep internal electrical components from coming into contact with ground water. Multiple ring/guard assemblies are available for a customized finish. Techlight’s proprietary OpticapSystem™ utilizes interchangeable optical lenses & reflectors to increase fixture lumen output efficiency. The system is provided with a high performance convex lenticular prismatic flood or a plano-convex spot optical lens. The flood & spot optical lenses are molded from low iron tempered glass. A 96% reflective UV stabilized injection molded reflector is included with each system. A variety of glass color filters are available to meet the designers specific color control needs. The composite guard rotates 360° for glare control. NOTE: A Techlight Surge Protector must be incorporated into the LED system at the beginning of each circuit as a minimum. Failure to do so will void the system warranty. Fixture operates at 9-16VAC or 9-24VDC input voltage. A 36 watt LED source provides approximately 1716 to 1831 (CW) Lumens of light. Fixtures are designed to be in-ground burial lights and should be installed according to the installation instructions made available by Techlight. Proper drainage and substrate must be provided for water to flow freely through the well sleeve. A ¾” conduit entry is supplied into the anti-siphon chamber of the housing. Concrete pour kits available (see Accessories). ETL listed for wet locations (IP67). Meets US and Canadian safety standards. -40°C to 40°C ambient operation.